You could probably call the KTM 300 the Volksmotard; the people’s motorcycle. Never mind what Pros ride or what champions race, the KTM is 300 was inspired, designed and demanded by everyday riders. American riders. Its list of pro championships is surprisingly short, but the KTM 300 is the most demanded and respected dirt bike among the rank and file of American Regular Guys, and it’s held that position for over 20 years. 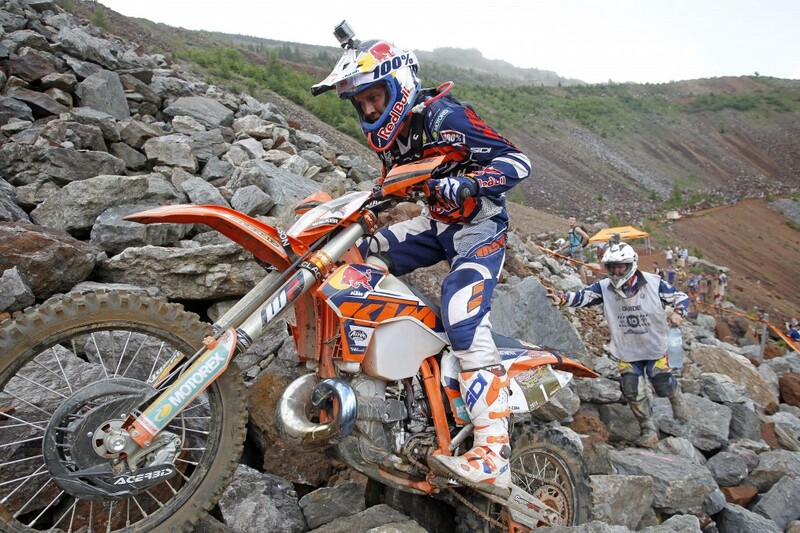 KTM has a long, long list of off-road champions. All of them rode the 300 at some point, but were more closely associated with some other model. Kevin Hines predates the modern 300, and only occasionally rode the 273 and the 350 of his day. Jeff Russell and Mike Lafferty loved the 300, but raced the 250 more often on the way to their respective National Enduro titles. Scott Plessenger took a 250 to his GNCC titles, and while Shane Watts did ride a 300 in route to the title in 2000, he also rode all the other bikes in KTM’s line up, just to say he did. Juha Salminen, David Knight, Kurt Caselli, Russ Pearson and most the other famous KTM men rode something else. In EnduroCross, Taddy Blazusiak only recently warmed up to the 300, although his first big win came on a borrowed 300 in Erzberg. Despite all that, the 300 has been at the top of KTM’s sales charts for most of its 21 year run. It’s a bike that owes its success to real riders not sales campaigns or factory racing efforts. Today, KTM is almost a household name, with dozens of championships and respectable market share. But back in the ‘80s, it was an obscure Austrian firm, struggling to get attention on the world stage. In the U.S., it could only hope to regain the recognition that it achieved under the Penton name 10years earlier. But times were tough, and the company teetered on the brink of financial disaster. Its main calling card was the niche bike. KTM would explore odd displacements and off-beat applications. It had bikes for the woods, bikes for the desert, bikes for motocross and cross-platform bikes for a little of everything. The very first KTM 300 grew out of that philosophy. It was in 1986, when ISDE rules stated that a bike could run in the Open class if it were anything larger than a 250. By that time 250s were turning faster lap times than 500cc two-strokes, so KTM decided to make a 250 for the Open class. The bore and stroke of the KTM 250 at the time was 67.5 by 69mm, and the engineers punched out the cylinder as far as it would go. Three and a half millimeters later the KTM 300 was born, only it really measured 273cc. At the same time, the engineers tried the opposite approach, taking the 500 and sleeving it down to a 350. As it turned out, the 350 was a better machine, and it won on the playing field on public opinion. The 300 was discontinued in 1987 while the 350 lived on. But the big motor was on its last leg and everyone knew it. It still had a left-side kickstarter and a right-side output shaft. The 350 simply proved the concept would work; that the ultimate two-stroke displacement might lie somewhere between 250 and 500cc. 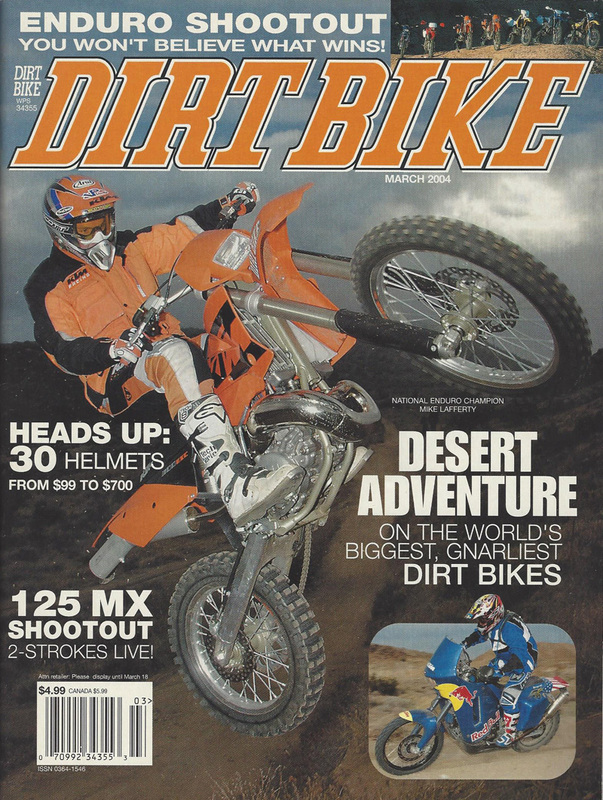 Mike Lafferty on the March 2004 cover of DB riding our ’04 300 test bike. The concept of a big 250 inspired KTM engineers to try the idea again in 1990. Only this time, they put a little more effort into the project. Both the bore and the stroke were changed and the present-day 300 was born. This time it was 297cc with a 72 x 73mm bore and stroke. Beyond that, the port layout changed along with the ignition timing and the carburetion. The bike was eventually offered in several forms: an EXC (woods), DMX (desert) SX (motocross) and TMX (EPA legal). The year 1992 was a strange year for KTM. The products had improved dramatically. Sales were better than ever. But out of nowhere, the company suddenly announced bankruptcy. Everything stopped for a short period of time while financial muckity mucks performed their dark magic and reorganized the entire corporation. When the smoke cleared, KTM reemerged, seemingly stronger than ever. For several years, the 300 remained in the shadow of the more successful 250EXC, which won shootout after shootout in the pages of Dirt Bike. The 300 hadn’t yet realized its true potential. The main reason was the ignition. When Motoplat went out of business, KTM had to scramble for a new ignition maker. SEM got the job. It wasn’t a bad unit–it worked well on the 250. But the 300 developed a reputation for being unjettable. It was rich and lean at the same time. It wasn’t until 1997 that KTM moved to Kokusan ignitions and almost all those troubles disappeared. In the intervening period, KTM expanded its niche philosophy by building a 360 on the same platform. This bike was offered in 1996 and 1997, but wasn’t a hit. 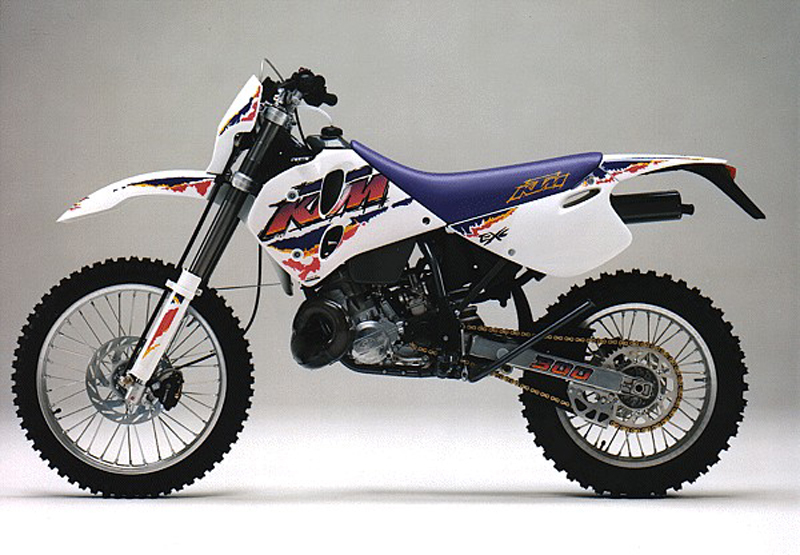 It was punched out to a 380 in 1998, and that bike was more popular, particularly in the west and on motocross tracks. The year 1998 was a big one for another reason. The whole line was completely changed to incorporate what would become KTM’s signature design; the linkless PDS suspension. 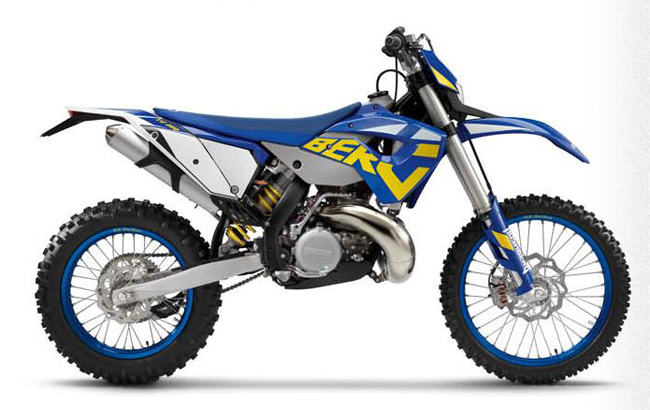 The design was never well received by the motocross world, but off-roaders loved it and the 300 began to reach its stride. The next year brought the hydraulic clutch and the 300 was unofficially elected as America’s off-road bike. KTM realized that the 300 was becoming The Bike and began to invest more time and development resources in the motor. The 2000 version came with a new cylinder that was substantially improved. In 2004 the motor got upgraded again with a different bore and stroke; oddly enough the 250 and 300 would once again share the same stroke, but this time it worked better for both bikes. From here on, the KTM 250 would absolutely dominate the dyno in two-stroke comparisons, and the 300 was just a smoother running, torquier version of the same thing. In ‘08 electric start came and revolutionized the two-stroke world. It also got a small cylinder and a new processor. The Husaberg chapter in the KTM 300 story began in 2010. The brass at KTM didn’t quite know what to do with Husaberg, which had been acquired 15 years earlier to jump-start the four-stroke program. For a while, a complete different line of motorcycles was offered under the Husaberg name, but that had proven economically impractical. Eventually, Husaberg four-strokes became 90 percent KTM. 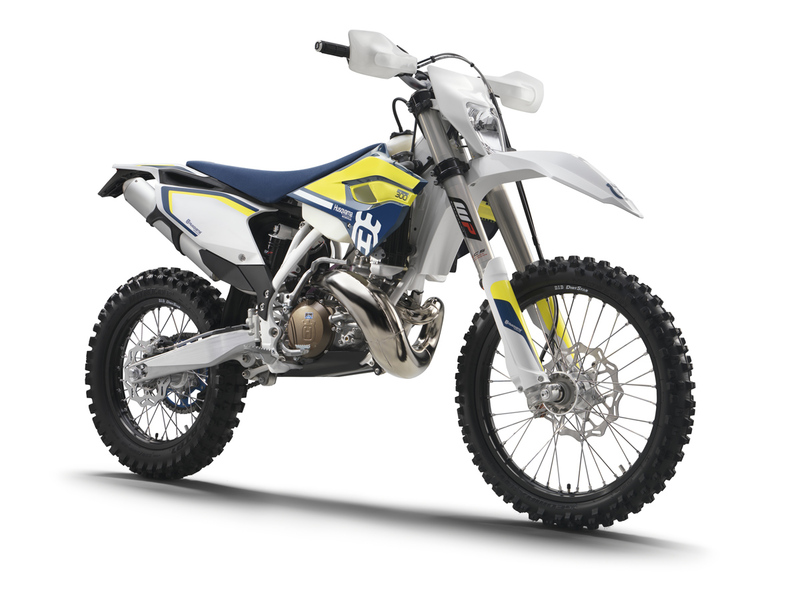 In 2010, a 300 XCW became the first two-stroke with the Husaberg name. It was slightly different from the KTM version, with new bodywork and suspension settings. In 2013, the Husabergs were rebadged as Husqvarnas. The next big chapter came in 2017, when both KTM and Husqvarna got a new, lighter 300 two-stroke motor. It also marked a switch to a Mikuni carb. There are now four variations of the bike on the market. 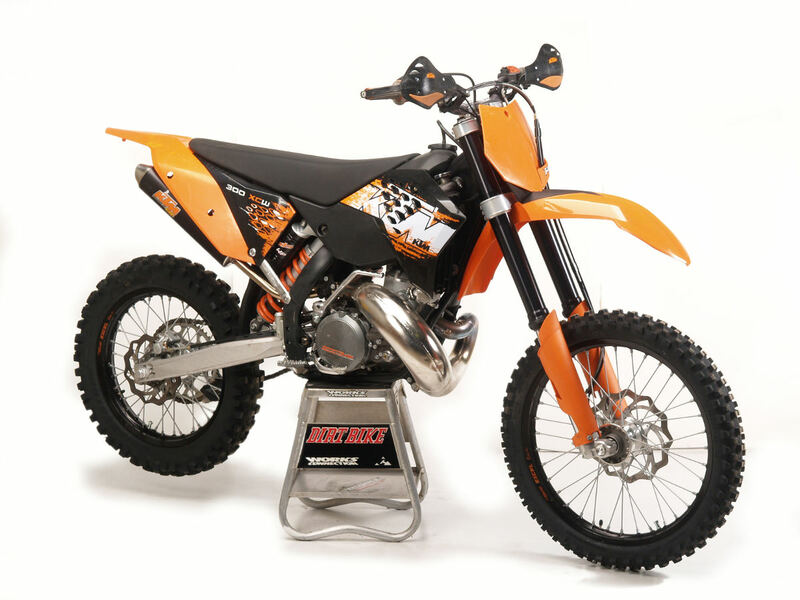 The Husky TX300 and the KTM 300XC are the more race oriented models. 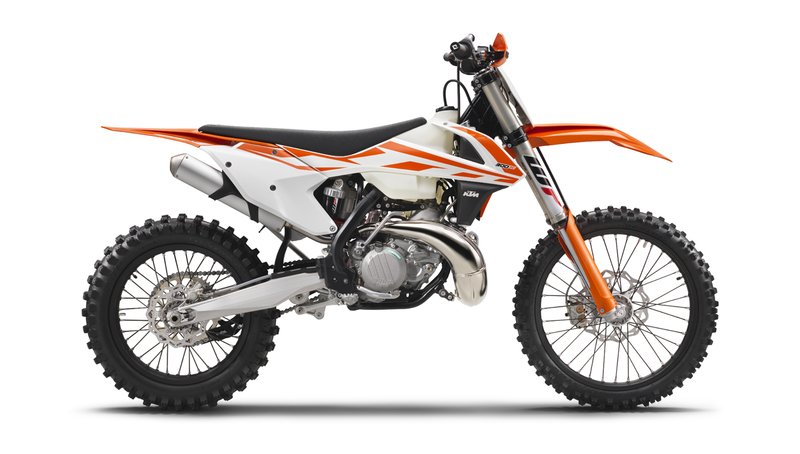 The Husky TE300 and KTM 300XC-W are trail oriented. 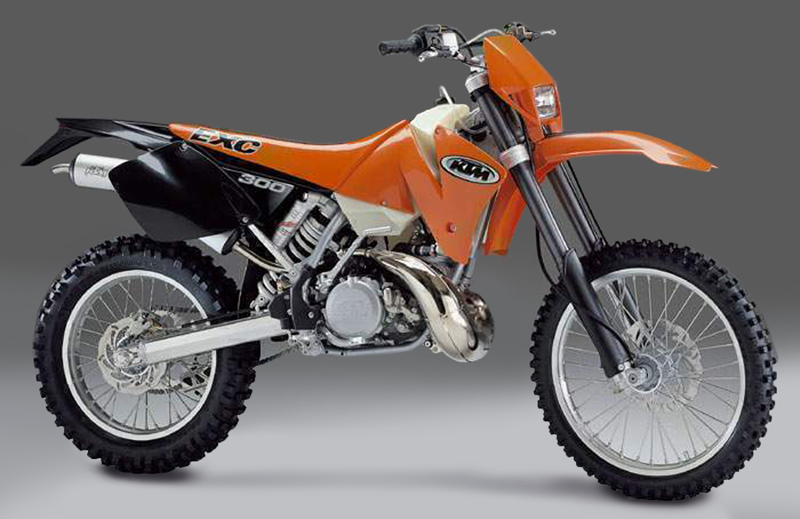 Of those four, only the KTM 300 XC-W has the PDS rear suspension. All others have linkage. If you get any used 300 from ‘04 and later, you just hit the jackpot. Of all the used two-strokes on the market, the KTM 300 holds its value the best. The 2000, 2002 and 2003 models are pretty good, too. Prior to that, we’re talking about 12 years of rust, wear and tear, so it’s anyone’s guess. Those bikes were good in their day, but condition plays a much bigger part when it comes to old metal. You have to resign yourself to having a few jetting problems with the earlier models. We complained in those years that no two 300 took the same jetting. The truth is that most riders dropped the needle and the main jet, and just ran race gas if detonation were too bad. Regardless of the year, the 300 did well with a change in silencer to either FMF or PC. An aftermarket pipe did wonders for the power output, but sometimes the detonation issue would get worse. Of course, you could play it safe and get a brand new KTM 300. 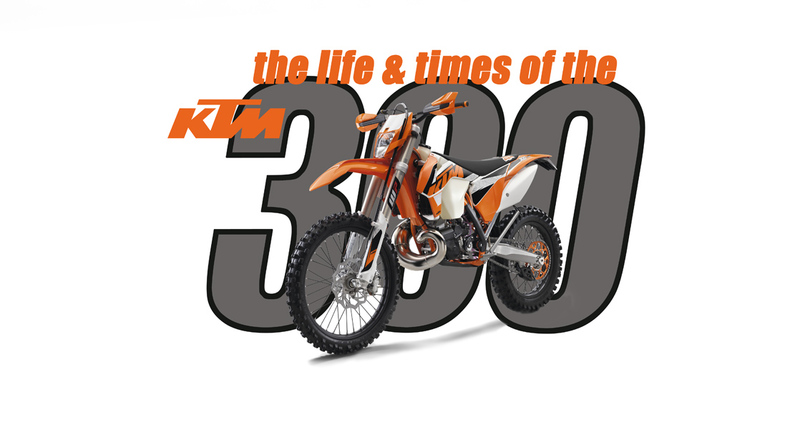 Lots of people do– The 300 has carried KTM through good times and bad times. Since its introduction so long ago, total sales numbers place the 300 as the number-one selling KTM displacement. And there’s still no safer investment in the off-road world. For a full test of the 2017 Husqvarna TX300, click here. 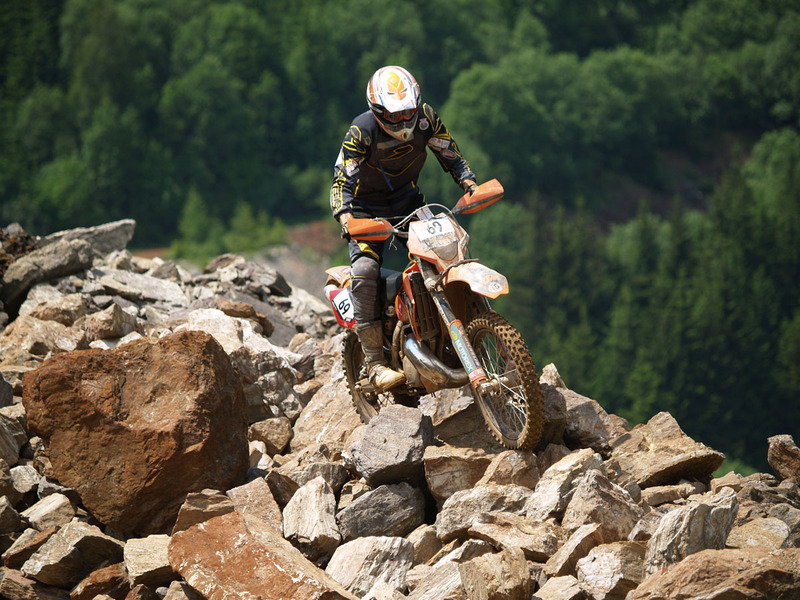 For a test of the 2015 KTM 300XC, click here.